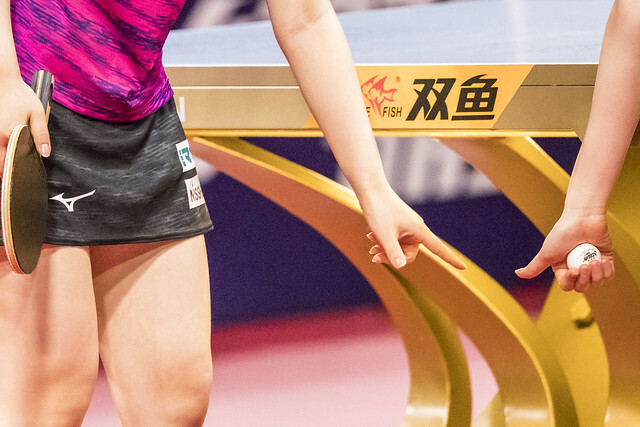 A repeat of the final staged in Düsseldorf last year on Saturday 3rd June at the Liebherr 2017 World Championships was eagerly awaited and anticipated at the Seamaster 2018 ITTF World Tour Platinum Australian Open in Geelong. It was not to happen; the pairs who had contested the Heydusek Prize in the German city were both beaten at the semi-final stage of the Mixed Doubles event on the late afternoon on Friday 27th July. Furthermore, both suffered at the hands of the Korea Republic. Japan’s Maharu Yoshimura and Kasumi Ishikawa, who had lifted the precious trophy and occupied the no.3 seeded spot in Geelong, experienced defeat at the hands of Lee Sangsu and Jeon Jihee, the top seeds (13-11, 11-9, 11-9). At the same time Chinese Taipei’s Chen Chien-An, the no.4 seeds, the runners up some 13 months ago on European soil, experienced the same fate. They suffered at the hands of Lim Jonghoon and Yang Haeun, the no.4 seeds (11-7, 11-9, 11-13, 11-6). It was for both Jeon Jihee and Yang Haeun a degree of consolation for the disaster they had experienced earlier in the day when losing a total of seven match points in their Women’s Doubles semi-final contest against Japan’s Hina Hayata and Mima Ito. A most professional attitude, both deserve great credit for their ability to resign the past to history and respond. Notably for both Korean partnerships it is the first time in an ITTF World Tour Mixed Doubles final. In both China and last week on home soil in Daejeon, the pairs were together; in the former both reached the semi-final stage, Lee Sangsu and Jeon Jihee lost China’s Lin Gaoyuan and Chen Xingtong (11-3, 11-7, 4-11, 11-8), the eventual winners; Lim Jonghoon and Yang Haeun, suffered at the hands of Masataka Morizono and Mima Ito (11-7, 12-10, 11-5). Meanwhile, most pertinently last week they met at the quarter-final stage in Daejeon; Lim Jonghoon and Yang Haeun won in three straight games (11-4, 11-6, 11-5), prior to experiencing a penultimate round defeat at the hands of China’s Wang Chuqin and Sun Yingsha (11-9, 14-12, 11-9, 11-6). The final awaits but whatever happens, for the second successive week, the title is destined for the Korean Peninsula; last week in Daejeon the host nation’s Jang Woojin and DPR Korea’s Cha Hyo Sim emerged the champions.